TopMan has become not only another competitive mass retail brand, but a label thats ports a seasonal designer collection to its client. The Western theme looks had more of club attire - rock studded - looks then you would've imagined in the average adventurous cowboy. Floral prints have begun to be the must have trend in menswear, and TopMan made sure they were at the top of the retail league. 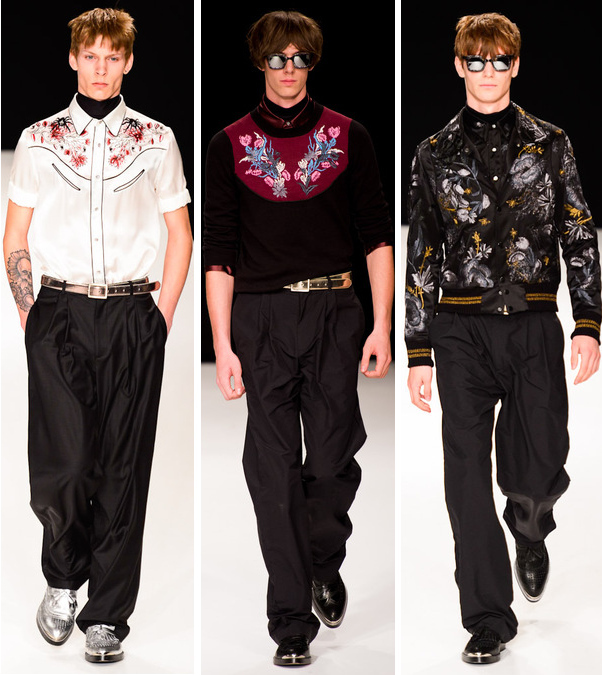 The details of its innovative silk (satin) embroidered western shirts were as sleek as they could be. Jackets too had a fresh appeal to the cowboy look - delicately embroidered, but tough enough for any men. Accessories came available in glossy gold and sliver tones. Sweaters may have felt somewhat of a feminine design with these prints, but in today's world TopMan sent a message across. There is no girly thing about floral prints, it's just a man's confidence of appearing unmanly. So confidence is all there is to always look manly enough to wear anything that comes in your way. Jonathan Saunders could be a designer who most of us may not be as familiar with when it comes to naming English brands. His way of experimenting with prints and color techniques is what should put him on the list of must see designers. Floral prints may be a subject of matter for men, but Saunders gray boxy jacket with a stamped, semi-faded blue flower felt appealing to the man who wants a small dose of the trend without overdoing it. His dress shirts came towards a younger audience of boys who seek for the most cool, innovative, and masculine form of dressing. Suits had a nice faded print effect. Although some of the looks combined together may have felt a little too in your face type of thing, you know you'll still find a great piece of item here to incorporate into your own dapper look. In other words, these wasn't a bad collection at all. 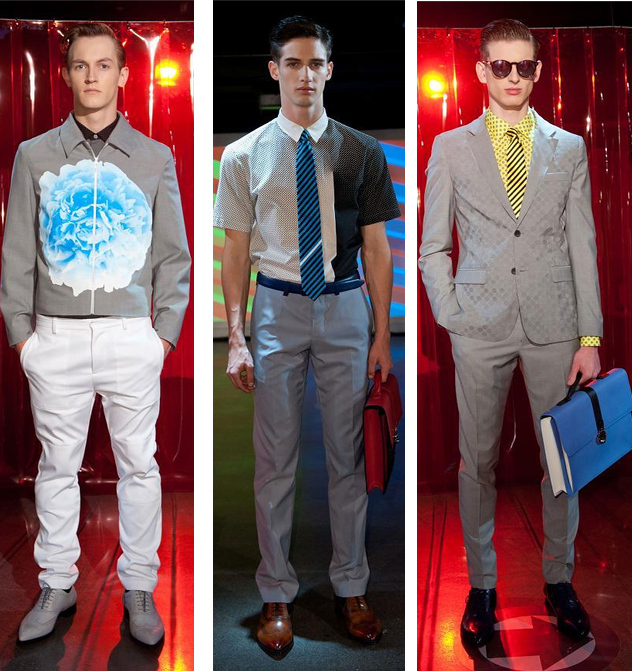 Casual, formal, or semi-formal. 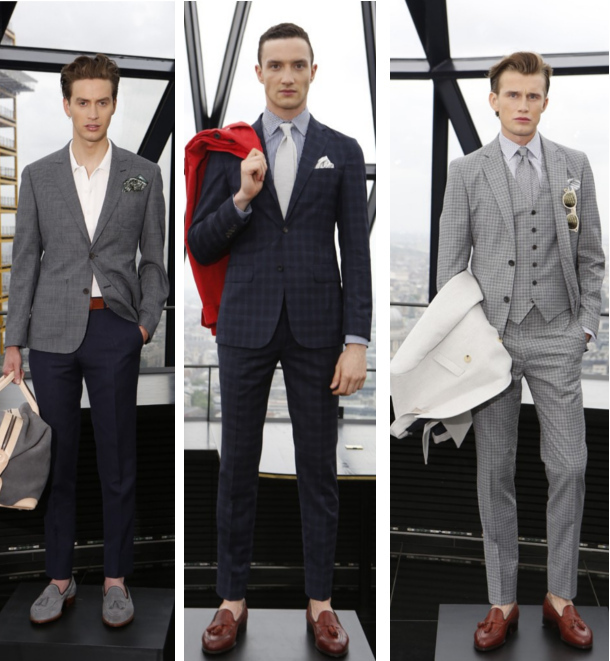 It doesn't matter how the Hardy Amies guy dresses, for he'll still look like the rich and dapper gentleman he is. The price tag says it all - the most refined English tailoring straight from the streets of Savile Row. The choice of a navy plaid suit - perfectly tailored with its fitted trousers - couldn't have been executed in any better form than with a red outerwear jacket for those chilly/rainy times. Another three-piece light gray plaid suit screamed sartorial-ism in every detail. Even the most semi-formal of all looks, such as the first one pictured above in a gray suit combined with a white polo shirt and rich navy fitted trouser, could be one to choose for a lunch date or meeting with some friends. The craftsmanship of Amies' tasselled loafers were the final touches that complimented the whole looks of a gentleman who appreciates English tailoring at its max. Being rich sometimes has its pros.